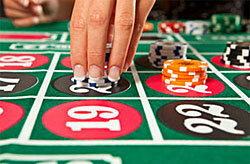 Roulette game has always attracted players with the unpredicted outcomes and exciting gaming process. Back in the 18th century people liked playing roulette but were also afraid of it as it was considered to be a mysterious game as all numbers on the roulette wheel equals to 666, the number of a devil. However, the inventor of the wheel didn't even think of creating a new game, especially the one connected with some special powers. The roulette history gives us clear notion of roulette game appeared and at what circumstances. Blaise Pascal, the famous mathematician, was trying hard to create the perpetual motion machine and invented a wheel similar to the modern one in roulette. The scientist was conducting many experiments during the course of which he failed to achieve his goal as a wheel was constantly stopping. However, this failure gave us the fabulous game. Roulette was popular among lots of players around the world who were trying to win big. Lots of roulette betting systems were created to help players get what they wanted. The oldest of all is Martingale roulette strategy. and is applied even at online casinos. This strategy can be used only for even-money bets as black or red, even or odd and big or small. The main idea of the Martingale roulette strategy is to double up the amount of the each bet after the loss. It means that if a player places $5 and losses, the next bet should be $10. The doubling up repeats until a player luckily wins and only after this lucky event a bet is reduced to the first amount. The curious thing about this system is that players should place bets at one and the same place. However, it should be taken into account that every roulette table has its limit and it is very easy to exceed it by constantly increasing the amount of bets. The main weak point of the martingale roulette strategy is that it is useless on practice as every roulette spin is an independent event with no influence on the next outcomes.